EghtesadOnline: In the wake of severe drought affecting 334 cities with a combined population of 37 million over the past two years, the administration has allocated $237 million to undertake 195 water projects in small towns and villages. According to ISNA, the Energy Ministry will spend the budget to develop three sets of plans. Giving a breakdown of the plans, the news agency noted that the first plan entails developing 101 initiatives, worth $100 million, to supply water to 164 towns. 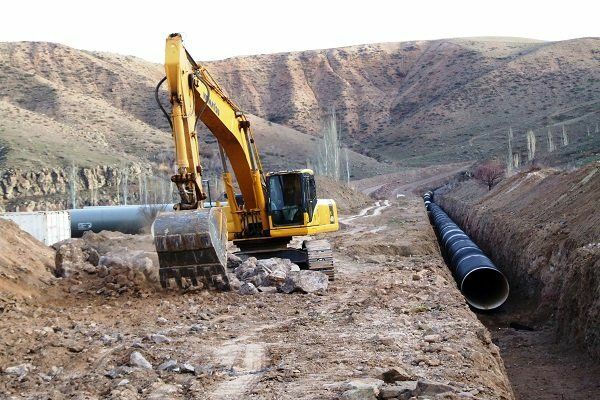 The plan includes laying water pipelines, upgrading wastewater facilities and digging new wells in underprivileged areas of Kerman, Khorasan Razavi, Hormozgan and Sistan-Baluchestan provinces, Financial Tribune reported. The second plan is to improve the quality of drinking water in 57 towns at a cost of $18 million. The other plan, providing 6,000 villages with drinkable water, will be executed at an estimated cost of $46 million. The rest of the budget will be used to complete 40 pending projects to help alleviate water shortage in 59 towns. According to Shahin Pakrouh, a deputy at the National Water and Wastewater Engineering Company, the country has hardly received 167 millimeters of rain since the beginning of the current water year (September 2017)—a drastic fall of 26% compared with last year's corresponding period that is unprecedented in the last 50 years. "Household potable water consumption per capita amounts to 150 liters per day," he said, adding that if the consumption reduces by 20%, water rationing will not be on the agenda to contain water crisis in metropolises like Tehran, Isfahan, Bandar Abbas Shiraz and Yazd. Pakrouh noted that 25% of water consumption per capita are wasted, of which 13% is "real" and 12% is "apparent". Real wastage is the amount of water discharged from the water distribution system while apparent wastage is the amount consumed but not accounted for due to a number of reasons, including deficiency of water meters. "Real water wastage should decrease by 0.5% to 1% each year for which an annual budget of 15 trillion rials ($359 million) is required," he said. Experts believe Iran should make preparations for a water-scarce future. "Prudent consumption is a key strategy to supply water under the present critical conditions," the company official said. Official data suggest water consumption in the agricultural and industrial sectors has a mere 30% efficiency, which pales in comparison to the global average of 75%. This is while the rate of precipitation in Iran is about a third of the global average. "With an eye on reducing the wastage of dwindling water resources across the national supply system, NWWEC and Japan International Cooperation Agency signed an agreement to cut water loss in central Iran last year," Pakrouh said. Reportedly, the agreement, piloted in the city of Khansar in the central Isfahan Province where water wastage is three times the average in major Iranian cities, is aimed at reducing the drainage of "non-revenue water" that is pumped but lost or unaccounted for before reaching consumers. According to data by the Geological Survey & Mineral Explorations of Iran, some 37 million Iranians are living in water-stressed regions. Iran suffers from low rainfall, excessive consumption and high levels of water loss because of aging supply infrastructure and outdated irrigation methods.